What is SCADA? – SCADA in an acronym for Supervisory Control And Data Acquisition, a category of computer programs used to display and analyze process conditions. Poorly understood by most non technical authors on the subject, SCADA is only one component of an automated facility and does not directly interfere with actuator devices such as valves, pumps, or motors – this is achieved by industrial controllers that operate in real time and have no display and keyboard. SCADA is the front-end of an industrial process to human operators. In the case of Stuxnet, all process manipulations occurred on controllers, not on SCADA systems. Five months later a seemingly unrelated event occurred. A computer security firm in Belarus was called in to troubleshoot a series of computers in Iran that were crashing and rebooting repeatedly. Again, the cause of the problem was a mystery. That is, until the researchers found a handful of malicious files on one of the systems and discovered the world’s first digital weapon. 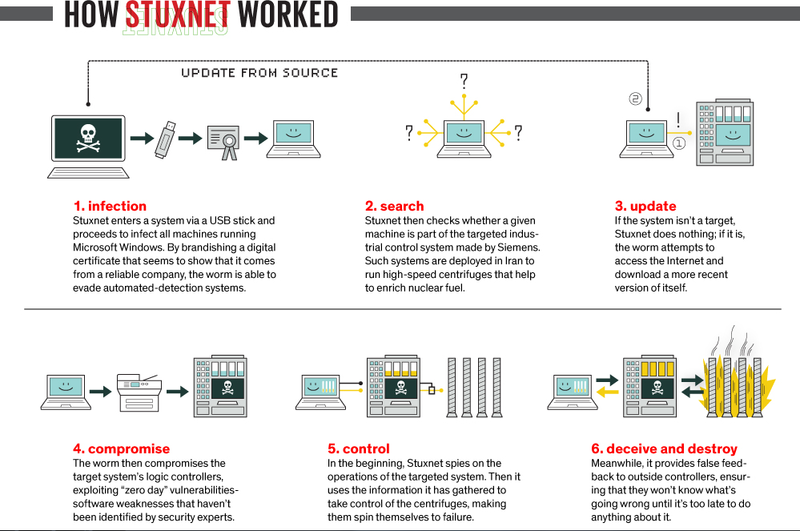 Stuxnet, as it came to be known, was unlike any other virus or worm that came before. Rather than simply hijacking targeted computers or stealing information from them, it escaped the digital realm to wreak physical destruction on equipment the computers controlled. Countdown to Zero Day: Stuxnet and the Launch of the World’s First Digital Weapon, written by WIRED senior staff writer Kim Zetter, tells the story behind Stuxnet’s planning, execution and discovery. Stuxnet, a 500-kilobyte computer worm that infected the software of at least 14 industrial sites in Iran, including a uranium-enrichment plant. Although a computer virus relies on an unwitting victim to install it, a worm spreads on its own, often over a computer network. This worm was an unprecedentedly masterful and malicious piece of code that attacked in three phases. First, it targeted Microsoft Windows machines and networks, repeatedly replicating itself. Then it sought out Siemens Step7 software, which is also Windows-based and used to program industrial control systems that operate equipment, such as centrifuges. Finally, it compromised the programmable logic controllers. The worm’s authors could thus spy on the industrial systems and even cause the fast-spinning centrifuges to tear themselves apart, unbeknownst to the human operators at the plant. According to Ralph Langner’s ‘To Kill a Centrifuge‘ – To help asset owners and governments protect against sophisticated cyber-physical attacks as they will almost definitely occur in the wake of Stuxnet. Public discussion of the subject and corporate strategies on how to deal with it clearly indicate widespread misunderstanding of the attack and its details, not to mention a misunderstanding of how to secure industrial control systems in general. For example, post-Stuxnet mitigation strategies like emphasizing the use of air gaps, anti-virus, and security patches are all indications of a failure to understand how the attack actually worked. By publishing this paper we hope to change this unsatisfactory situation and stimulate a broad discussion on proper mitigation strategies that don’t miss the mark. This fact made everybody reflect on the fact that cyber-security was not anymore a matter of securing servers and software, company data and continuity, but a matter of citizen safety.